The 1973 World Series matched two teams best known by their abbreviations, the Athletics and Metropolitans. It lasted an entertaining seven games, the home teams winning almost every one, and Oakland ultimately captured their middle title of a back-to-back-to-back championship run. It doesn't come up in conversation much now, but only two franchises managed this feat ever, the A's from 1972 to 1974 and (much better known) the Yankees on multiple occasions. 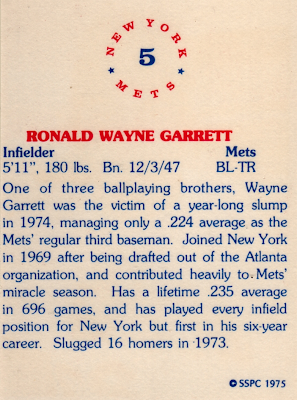 So why a 1973 discussion for this 1975 card? Like most Vietnam-era seasons, pitching dominated the series and both lineups managed only six homers combined. Even series MVP Reggie Jackson hit just one. So who has two thumbs and slugged a pair by himself? This guy. Eyes on the prize, a.k.a. those right field stands. Today's profile is also part of the eventual end of Topps' baseball card hegemony. 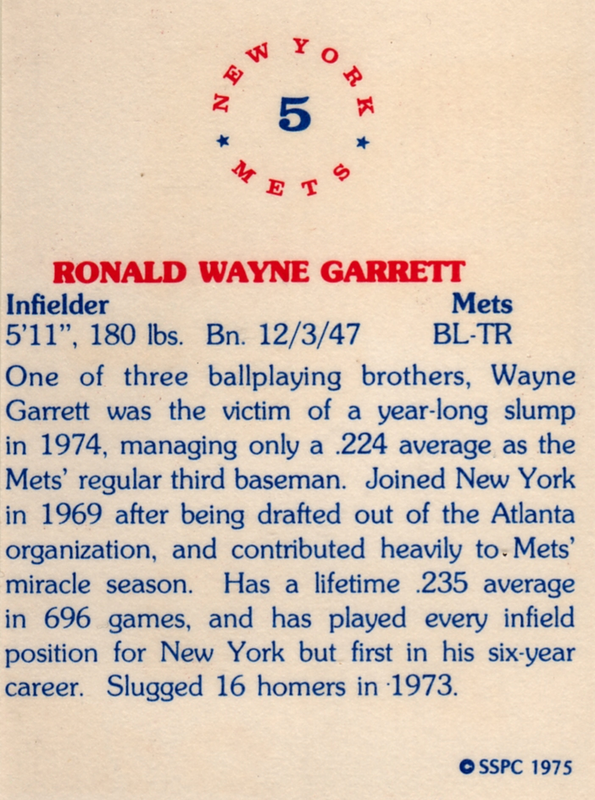 Mike Aronstein's SSPC (Sports Stars Publishing Company) printed several "small" sets as a run-up to their 630-card 1976 issue, including this New York combo of 23 Yankees and 22 Mets. He sold them by mail order (not at stores or candy counters) and charged a few dollars for each 45-card set. 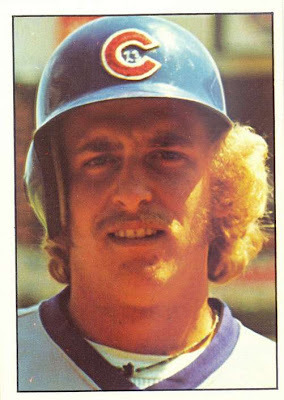 I like SSPC's smaller sets and think this one used better photography than the bigger 1976 version, with good lighting--note no shadows on Wayne's face--and fewer "ouch, the 1970s" shots. 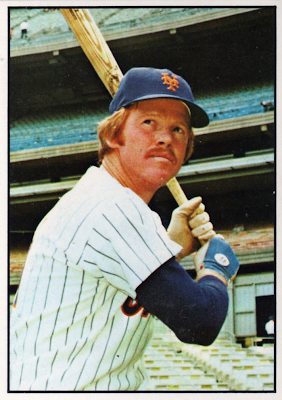 Topps considered SSPC enough of a challenge to issue a cease-and-desist court order in 1976, but their sets remain available and affordable via eBay, CheckOutMyCards.com, and other Internet card sites. I pick Tom Seaver for "best" on the 1975 Mets checklist, unless you give manager Yogi Berra credit for his playing career. Value: Most SSPC singles cost less than $1.